James, the managing director of Cintec International in Newport, Wales, has worked with the engineering firm restoring historical buildings in Egypt for 18 years, including mosques, temples, and both the Red and Step Pyramids. The latter was the first high-rise structure built in ancient Egypt and stands at 62-m (203-ft) tall. For centuries, the pyramids have been an object of wonder due to the size and ingenuity behind them, and James has created a new theory on how they were constructed. While restoring the ceiling of the burial chamber in the Step Pyramid, James made some observations. The Egyptians had used timber beams to hold the stone ceiling in place, but they recently started to buckle under the weight. James’ team put in anchors to secure the ceiling, but while they were drilling 4-m (13-ft) holes into the stone, he noticed they never drilled through stones more than 400 mm (16 in.) wide. This contradicts the current theory the large stones seen on the outside were used all the way through the pyramid. James theorizes the ancient builders used high-quality stone on the outside of the pyramids and lower-quality infill on the inside. He says during his work on the Red and Step pyramids, he witnessed the ancient builders’ knowledge and technique—with every project their skill grew so they could perfect previous design flaws. This is why his discoveries on the smaller pyramids led to his belief the Great Pyramid was built the same way. James believes the pyramids consist of three layers: the inner, middle, and outer cores. He says the inner core consists of smaller stones and concealed larger blocks that were used to create internal ramps, allowing them to build the pyramids from the inside out. The ramps would have started midway and zig-zagged the width of the pyramid matching the height of the middle core. Heavy middle-core blocks could be raised on the internal ramps and positioned at the perimeter, while the inner-core stones could be handled by men and animals. As the ramps got steeper, he suggests palm-tree trunks could have been embedded to slide the heavier core blocks on wooden sledges. According to James, the middle core is three blocks wide—diminishing in size as they center—used to retain the core filling and connect the outer cladding layer. The step design meant the builders were able to connect the cladding to the pyramid while supporting the weight of the cladding blocks at the same time. The final layer is the outer core where cladding was used to smooth the outer appearance into the true pyramid form. 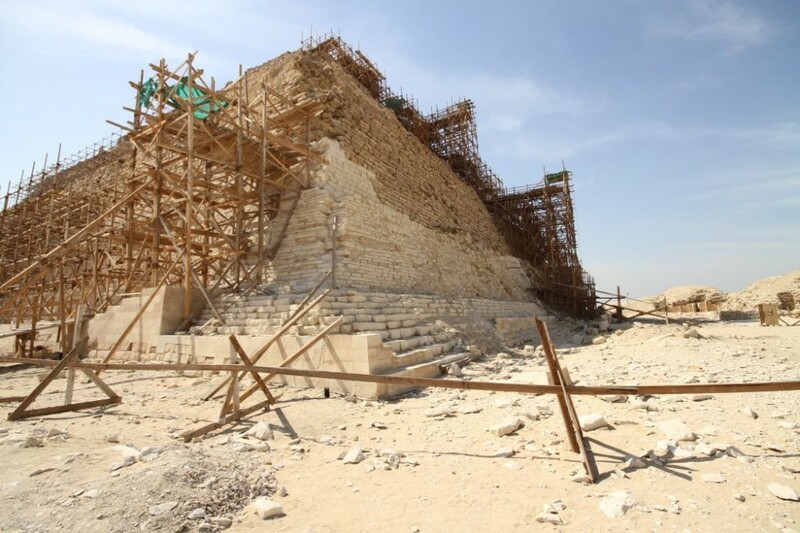 James suggests a small amount of scaffolding could have been used to fix on the outer cladding and moved around to work on different parts of the pyramid. James admits it is only a theory, but does point out a discovery made in the 18th century by either archeologists or treasure-hunters when they tried to break into Khufu’s Great Pyramid of Giza. Using gun-powder, they created a gash on the side that exposed an assortment of large blocks that were neither aligned with one another or course. This supports his theory the ancient builders used the technique of using high-quality stone on the outside and lower-quality stone inside. For another look at Egyptian construction, see “Repairing and Strengthening Concrete Structures in Egypt,” by Talat Salama.